Links The Forex market is the only 24-hour market, opening Sunday 5 PM EST, and running continuously until Friday 5 PM EST. The Forex day starts with the opening of Sydney's (Australia) Forex market at 5:00 PM EST (10:00 PM GMT / 22:00), and ends with the closing of New York's market, a day after, at 5:00 PM EST (10:00 PM GMT / 22:00), immediately reopening in Sydney restart trading. Note: EST is an abbreviation for Eastern Standard Time (e.g. New York), while GMT is an abbreviation for Greenwich Mean Time (e.g. London). 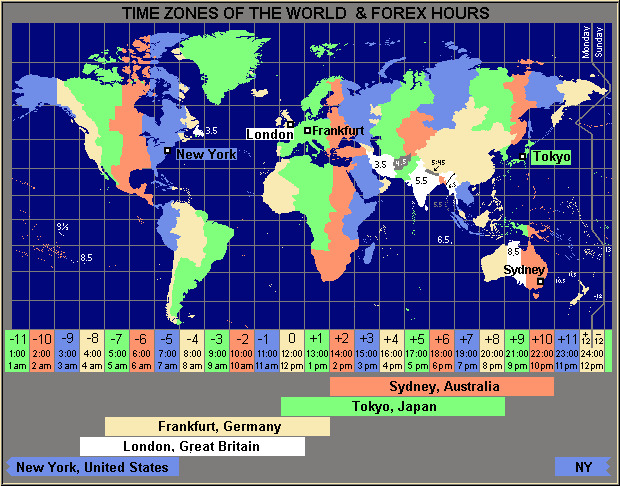 The main Forex markets, in the order of their opening times, are: Sydney, Tokyo, Frankfurt, London and New York. On the chart below, you can see the hourly course of the Forex-trading day. after the other markets (9:00 AM Local Time, while others open at 8:00 AM Local Time). The following table illustrates the opening and closing local times for a Forex day and week, in function of time zones. * The closing time is same as the opening time, but is refered to day after the opening. If you live in New York you can see from the table (GMT-5) that daily trade starts at 5:00 PM (17:00), and ends at 5:00 PM (17:00) the day after. The weekly opening is at Sunday, while the weekly closing is Friday. Familiarize yourself with your local opening and closing times, because this will impact when you must close your day trades. For example, if you live in London (GMT), the Forex day ends and restarts at 10:00 PM (22:00). If you open a position at 9:30 PM (21:30), and close it at 10:30 AM (22:30), your trade goes from one to another Forex day and rollover/swap are applied. If you open a position at 10:30 PM (22:30), and close it next day at 11:00 AM (11:00), your trade is intraday (closed within the same Forex day), and no rollover/swap apply. Important: A Forex day doesn't correspond to a normal/calendar day.